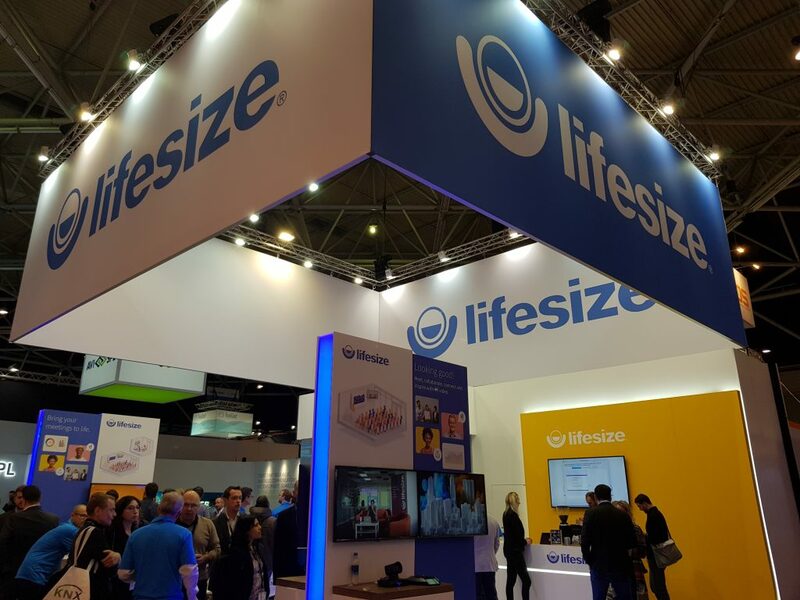 ISE 2019: The UC & VC wrap up – Lifesize makes some noise! 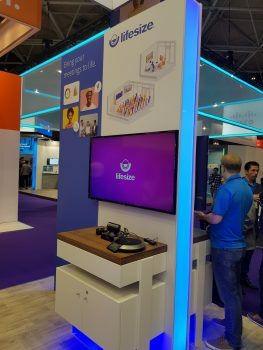 The second day of ISE started somewhat more focused than the previous (Read about my ISE 2019: UC & VC wrap up part 1 here) – i’d learnt that “finding my bearings” in a 18 hall arena wasn’t as simple as just having a wander around, and the knowledge of where most of VideoCentric’s partners, vendors & technologies were based meant that day 2 was to be spent fully in the Unified Communication hall. It was time to take a look at what other UC & VC vendors had to offer; who was shouting about what, what was on the cards from our partners for the rest of 2019 and beyond and who stood out amongst the rest. And this year, the ones that stood out loud and clear were Lifesize. Strong with their branding and proud of their position, Lifesize were making some incredible visual & verbal noise, not just in the UC hall but across the entire ISE event – displays, banners, online and offline pre-event communications… this year the Lifesize team were stepping up their ISE game. And all for good reason too. For those that have had the chance to visit the Lifesize stand over in hall 11, you’d know the three clear focus areas for the Lifesize team this year – 4K, Share and Teams. 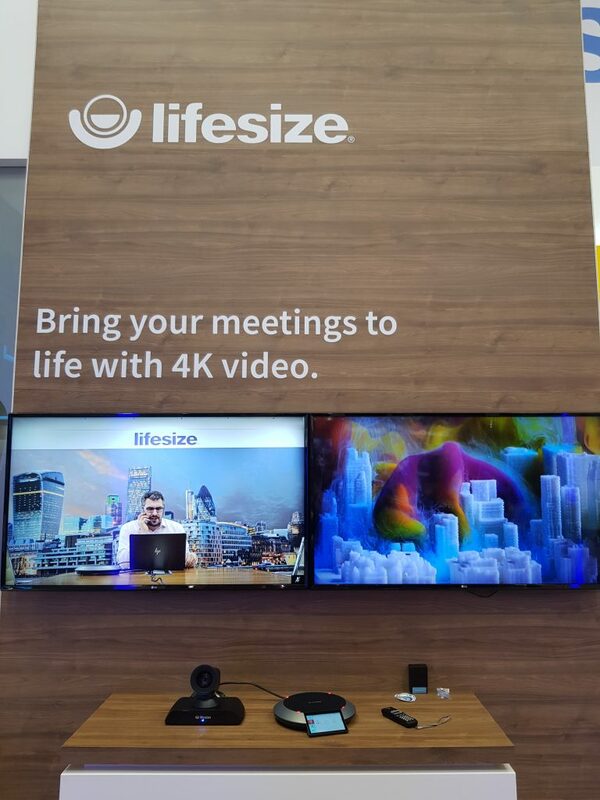 If you’ve been keeping an eye on the technology & AV news recently, you’ll have surely heard all about Lifesize’s huge announcement in December; the launch of the first ever full 4K end-to-end Video Conferencing solution. Yet another first in the history of Lifesize, it’s no surprise that the team were keen to show off and demonstrate the incredible quality of the Icon 700 system’s camera and codec, connected to the newly revamped Cloud service. It’s ability to transport 4K video and content simulteneously in a dual stream, in full frame-rate, between the stand in Amsterdam and the London HQ was truly exciting to see in action – those initially asking “do we really need 4K” were soon talking about the “truly exceptional video quality” and the many applications and benefits this could bring to the likes of healthcare, architects & creative services and more. We’re told that there’s plenty more to come around the 4K announcements in the very near future – so watch this space (or come and see it for yourself). Throughout the ISE event, there were a huge number of vendors demonstrating all manners of sharing solutions – the likes of Barco with their Clickshare and StarLeaf with their Pronto were just two of the many MANY offerings to “put my screen on another screen with ease” that were being demo’ed to potential integrators. However Lifesize has taken a different route than the rest with their Share device – with the announcements the week before ISE of the new features of the Share, including both Digital Signage and Whiteboarding applications, the Lifesize Share is proving it isn’t just any wireless sharing solution like the rest; it’s a cloud-connected platform for meeting room applications that’s only just scratching the surface of what it can, and will bring to the meeting space. Although Lifesize were demonstrating the digital signage application that’s been launched in partnership with ScreenCloud (that offers all displays and rooms with a connected Lifesize Share automatic access to over 70 digital signage applications), the exciting discussions between myself and Mr Cook, a Senior Engineers at Lifesize, were not just about what the Share can currently do, but the opportunity it brings to organisations for the future. With the device connected to the cloud, the meeting room is essentially opened up to an infinite number of functions and features which can be pushed out across the world as and when they are developed, to those that want them, without need for purchasing any additional hardware. 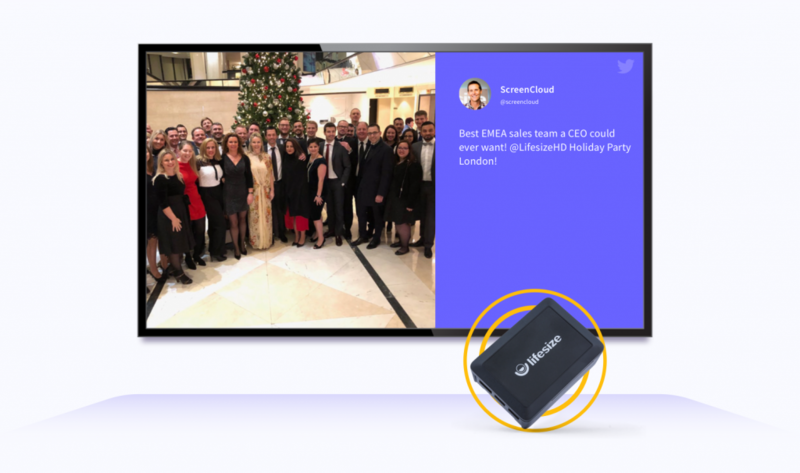 Whilst most organisations are generally not on Teams right now, many are talking about it as a future plan and it’s on their roadmap – Amongst many vendors at ISE, Lifesize were keen to show off their own integration with the Microsoft Teams platform. It’s vital that vendors such as Lifesize have good integration with the platform, to enable professional Video Conferencing to take place between those outside the Teams world and those within the Teams application. And it’s vital that the users workflow isn’t broken – scheduling and joining meetings are done from the Teams app, standard Teams chat commands can be used to create and join meetings etc. etc – a demonstration that proved far more simple and seamless than i’d expected and allowed me to breathe a sigh of relief after seeing one or two other not-to-be-named vendors demonstrating their somewhat bodged integrations, to put it nicely. 2019: Lifesize Makes Some Noise! We expect that by ISE 2020 you’ll be hearing, and seeing, far more from Lifesize not just from the AV world but around the rest of the world too. 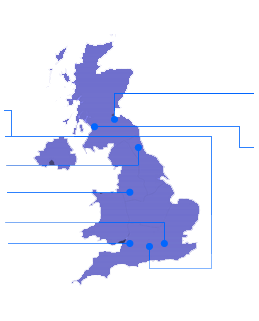 If you’d like to talk more about 4K Video Conferencing, Lifesize Share and Lifesize Video Conferencing, find out pricing, arrange a demonstration or trial or just learn more about how Cloud-based Video communications can work for you, why not get in touch with us today?